My name is Charlie and some of my interests include fitness/sports, graphic arts, spending time with nephews and nieces, and most of all, I LOVE Passive Income (Click "Follow Me" if you LOVE creating Passive Income, too). This is what led me to Affiliate Marketing. My ultimate goal is to NOT depend on an employer for my financial well being. Nor do I believe you should depend on an employer for the "benefits." After my employer closed down (a division of the Sheraton Hotels) and witnessing today's American struggling economy, I'm a firm believer that there is NO such thing as a secure job. Banking on that is playing "Russian Roulette." With that said, I feel obligated to issue this warning: Depending on an Employer or Government for your Financial Future is a disastrous strategy. I've come here to fulfill a dream of mine of setting up passive income streams that can be managed anywhere in the world. Freedom to live anywhere, move whenever I want (not when my employer says so), and spend time with family and friends because I can work WHENEVER I want, is very valuable to me. This also solves the problem of staying with an employer JUST BECAUSE OF HEALTH INSURANCE. It is really disheartening to me when people are overworked, stressed, and unhealthy, but must remain in that environment because they're getting health "benefits." As much as possible, we should get our own private health insurance that is NOT dependent on working X amount of hours for an employer. The irony? When you are hospitalized and need health insurance most, you will not be able to fulfill your work hours and you will lose your insurance. This is why I stress passive income, and not earned income. This also acts as a form of disability insurance, something we all need. Other passions in life include Fitness, Self-Mastery, Effective Communication, and Stock Trading. I don't want to become famous. I just want to make a living online. Anyone that can relate to anything mentioned above, click the "Follow Me" button and hope we can network to share our successes and failures together. Looking forward to meeting new members. Charlie welcome and I do feel the same way. I receiving my income from the government due to retirement and would love not to be solely dependent on it. This program is my way of attaining my goals. thanks for the incentives and reminders. I'm glad you made it to retirement with the government. I hope they don't renege on their retirement promises. With our MASSIVE debt problem out of control, I can see drastic measures being justified. All changes should be grandfathered in and applied to new government workers. Only the the government can get away with "breach of contract." Grrrrrrrr. Good luck with your Interment Marketing "career." Charlie, awesome bio! I feel the same way. I totally dig the idea of not becoming dependent on your employer for benefits. As much as they can be attractive, I can see where it can be a pitfall too. Thanks for sharing! Thanks for the comment. Yeah, I'm hoping for a more free market with health insurance this Presidential election. Buying across state lines would be good. Or, at least have employer sponsored health insurance be portable. A lot of people stay at their dreaded job JUST for the (health insurance) benefits! Just read your amazon article on how to find red hot products, thought it was really good and then went on to check out your profile. I think very much like you and have simliar interests and goals. Don't want to be famous. Do want to live a life according to my values "To live with honour, good humour and a kind heart". Ethically generating passive online income, whilst helping people acheive improved lifestlyes is one of my key life goals. Clicked the follow me icon and look forward to reading more about you. Ps Only went premium today, 7th day on WA. I wonder if you have you any tips on starting out? Any 3 things you wish you had or hadn't done when starting out? Sorry about not replying. Not sure if I just missed WA notification email or if I just wasn't notified about your comment. Anyway, if you're still in here, reply back. 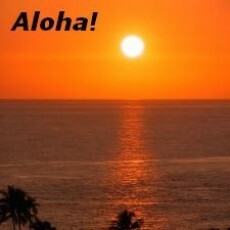 Hi Charlie, Aloha and love what you write at your profile. I can't agree with you more about job and financial security, there is really no guarantee. I wish you every success at WA! Thanks for your comment. Only when we lose our job do we "realize" there's no such thing as job security. After 10+ years at my job I thought I was pretty secure...until the news came. It was at that point I "woke up." Thank God I saved when I could. That is HUGE when there's no income coming in. Good luck with your venture as well! Saw a comment you made on another post and decided to come over to you space on WA. I hope you are still successful and doing well! Very original stuff on your website. Stocks have always made me nervous -- but I see several people on WA deal and apparently make money with that. I have laid off stocks for a while b/c I'm still recovering from the '08-'09 crash. I was thinking, if I can lose thousands in stocks, why not risk just a $100 and get something ranking that could possible make passive income indefinitely? Worse case scenario, I get zero sales and lose a $100. Sure beats losing $10,000, right? This is why I've been focusing on affiliate / local marketing and love it! Do you? I'm still studying. See where so many people get excited and do a lot of work and then drop out. Of course like you say not too much monetarily to lose. I just don't have a lot of time to lose -- so would like to find a path that would be a good choice to spend the time on. Learning here is sort of like going down the rabbit hole, I'm not quite ready to come up yet! And in the meantime plenty to keep me busy while I try to learn from those who have paved the path before. Seems squidoo used to be pretty hot -- these days seems in a lot of confusion and flux. But still, those are fairly easy to set up and not much continuous time requirement like an authority site demands nor need to even get a domain or fire up wordpress like a niche blog. I think that's how I found you when I got off studying that option. Yes, Squidoo has tightened up and only allow certain topics. It can work if that is your preference. Plus, if you read Kyle or Carson's guide, you know this is an "end of the buying cycle" keyword. They're typing in the business name ...so they've heard of them already...and just need a little "push" to do business with them. You could contact the owner of a business you dealt with and tell them how you loved their service/product and that you do Internet Marketing. Offer to make a review video AND rank it on Google Page 1 for a flat fee (or monthly, or whatever you feel comfortable charging) . Pick the business that has the highest customer (lifetime) value. Example: one customer for a Chiropractor is worth about $1000 since the patient probably sees the doctor MULTIPLE times. This will make it justifiable for them to pay you $97 or $157 or $247 or ??? for making and ranking the video. If your video brings in more than one patient for the Chiropractor, for example, would he/she get an awesome ROI? You bet! Tell them when people search for them to check them out your video will pop up and convince them to do business with them....so this an awesome way to advertise their business b/c this targets people at the "end of the buying cycle." Tell them videos are HOT. People LOVE videos. They stick out in Google so people WILL see their review. Thank you for that thoughtful and through reply, I will check this out more! Hi Charlie, Thanks for the follow. I read your profile and I totally agree with you! OK, I knew about the browser bookmark. I just thought there was a way to keep track of our "favorites" here in WA. Have a great weekend! Hi Charlie, regarding your question about new business licenses, my city's website lists new businesses under "Business" menu, also has a list of all licensed businesses in the city. Is access to your registered businesses free? I have to pay for a list of new businesses in Hawaii. But, I can look up a business one by one for free. Is that how your city's website is too? No, our list is free, at least right now, and it's printable. Sometime soon they'll probably figure out they can make revenue by charging for it. My city is a suburb of a larger city, where it appears to be much more difficult to acquire lists of any kind. Hi there Charlie I sure do relate to what you describe...ALL of it. Could tell you stories. Thank you for the follow. I noticed you are an artist. I used to love to draw and actually majored in Fine Arts in college. Did some oil painting but drawing was my thing. I don't draw much at all now, only because it's much cooler, IMO, with all the stuff you can do with graphic programs. Hope your passive income portfolio is growing and you are having as much fun with all this as me. Hi Charlie, I like your phrase, "I don't want to become famous. I just want to make a living online." That's the truth of it for me. I'm not about mansions and fancy cars...I just want to live happily and healthfully with my family, and not let lack of time or money be a roadblock to enjoying the things we really want to do. And if I can help other people have the same type of freedom along the way, while building my passive income online, that's a major bonus. Hope you are enjoying WA! Sorry for the slow reply. Been occupied with family matters. God Bless you and your husband! Your daughter is very fortunate to have loving and understanding parents. Whatever makes you or anyone happy can be created instantly. We don't need the actual thing present to make us feel happy. All we need to know is that the day will come when when we have that thing. For example, since we're all here to make money, let's say you found out that 10 years from now you will have $5,000,000 deposited in your bank account from Uncle Joe. Well, if you knew that, you know that financially you will be free. I bet just knowing that will change anyone's attitude b/c everything that happens from now until then is "temporary." The actual event didn't happen yet but our attitude has changed. We can feel happy even before the money comes in.... if we believe it WILL happen one day. May you feel happier right now. I usually am pretty happy, and things don't keep me down much. I have a family and friends I love, and we're all overall healthy...not much to complain about there. Everything else is just a moment, temporary as you say, and we have the chance to change the next moment with the steps we take today. Here's to enjoying and appreciating our futures, today! No need to reply back but I'll leave you with one more thought I heard on the radio (Dennis Prager Show) that has helped me reduce anxiety. Worrying is a WASTE OF TIME and ENERGY! It is a LOSE LOSE thought, and here's why. 1. Most of the time (not always, of course), the thing we're worrying about doesn't turn out the way we imagine it. The insurance companies know this well and make a profit on this stat. 2. Worry does NOTHING to stop the thing from happening. In fact, it only affects you negatively, i.e. anxiety, stress, health problems, mood, etc. PS I think I see that first commission being deposited in your bank account (if it hasn't already). I have to agree. 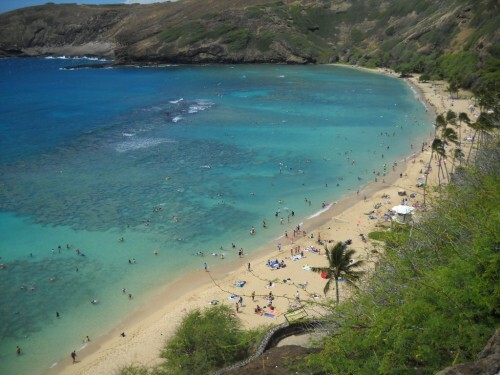 Hawaii's natural beauty is pretty hard to beat. I should get outside more. I see you're into art. I majored in Fine Arts in college. I have to admit though, I like (computer) graphic art better than oil on canvas, or even drawing. It's all that cool effects you can get that's appealing. Do you dabble with graphic art? Aloha Charlie... I see that you Squidoo :)... I am a follower of Seth Godin, a founder of Squidoo. I really enjoy his thought process, his writings, his knowledge of how marketing could and should be... I like his humor. He has definitely opened my eyes in the marketing arena.... I know the process marketing products very well, it's what i did for too many years.... The online process is so different than the bricks and mortar... like you, I also enjoy stock trading... have been doing it since 2006 and love it. I do technical trading and wave counting plus a little scalping here and there when volatility surfaces. Can be quite exciting. 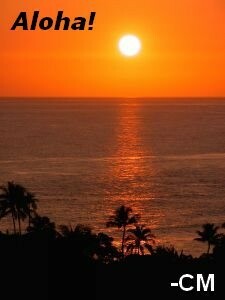 One of the members in my group lives on Kuaui... incredible sunsets and even whales sometimes. Do you follow a trading system? If so, what kind of win/loss ratio and risk/reward ratio have you been getting? I use Worden.com for realtime amazing charts... within Worden I belong to a club called First Wave which was gounded bt David Elliot who passed away late last spring from a long battle with cancer. We have specific chart setups and signals designed combined with personal criteria formulas for scanning and trading... we basically count waves... wave 3 generally being the big Kahuna :) As always, each of us has our own set of goals based on risk Tolarence. We watch futures closely. Most of us focus on one thing for short term and scalping. these days it's the battle of the Algorhithm bots... that is what scalping is all about... a good scalp move can last from 11 seconds to minutes. Scalping is not for the low risk trader. the risk/ reward is huge but not something just any one can do... because you can lose big very quickly... Anyway... gotta run... it's pre-market chat time with the club.. catch you later. Your innate time frame is definitely different from mine. Eleven seconds to a few minutes can produce a lot of losses really fast. That can do a lot of psychological damage and throw a game plan out the door. I think I'm more of a swing trader type time frame. Know of a high win/loss ratio swing trading strategy? Hey, thanks for the comment and the well wishes, Paula. Same to you. PS Don't forget to check out the WSS Google+ Group. I just joined the group and learning my way around Google +. Come and join us, Paula. thanks for the convo. have a great evening. If I hear of anything related to EBook publishing, I will let you know. No, seriously. Thanks for the chat. I did hear of createspace.com (Amazons hard copy publishing service) and eJunkie, clickbank, etc (that sell digital books). But, thought someone might know of a place that's easy to get in, take payments, deliver book, and deals with refunds (for a nominal fee, of course). Actually, now that I'm talking about it, I know there's a place that does NOT charge you any fees if you sell under a certain amount a month. They'll only charge you once you start selling over 100? books a month. That way, there's no expense pressure for beginners. I liked your recent training post, I have thanked you under comments. Wishing you continued success and happiness. Thanks for the comments, Alfred. Hope it gives people an easy system to choosing products. Hmmm, I've never converted a .psd file into html so I can't offer anything off the top of my head. I'm assuming it's a graphic template and you're trying to customize it? How can I used gimp to convert psd files into html? I've never tried saving any images in html format. I would save it as a jpg or png and use a webpage editor to get all the html codes. Hi. I MADE a mistake ...and bought a psd template instead of a html onte. Was trying to see how to convert it ....but I am seeing that prolcess is complicated. Out of my league at least. Hi Charlie, I like your bio, and I agree with much of what you say there, it is very difficult working in an environment that you don't know if you have a job from day to day, with little or no security. I hope you have found some success here. As a younger kid, I grew up with a false sense of security regarding finding a "secure" job. Now I realize when a company goes in the red, cuts HAVE to be made. Even the so called "secured" government jobs are being cut where I live. EVERYONE should have at least some income stream INDEPENDENT OF government / employer. Saving your way to build a nest egg is one way BUT it takes forever. The internet has made it affordable for ANYONE to start their own business / income stream. There are TONS of information online showing you how to make money. Wealthy Affiliate is just one source. I just hope, for their sake, that anyone who reads this message learn how to create money on their own, irregardless if they stay in WA or not. Independence is not only freeing, but a POWERFUL position to be in. Much success to you, "Gud." Yes, sunsets are beautiful. I'm sure you have your share of sunsets in FL. Squidoo is a great place to start testing to see if something sells, or even to just practice your affiliate marketing skills...b/c it's free. Just don't make your life depend on that income b/c THEY own the site and can change rules in an instant, i.e. no affiliate links promoting dating, stock trading, etc. If you pick a good keyword (meaning low competition, decent traffic, buying crowd) you will not only get traffic from Google but also Squidoo, especially if you participate on Squidoo, i.e. commenting, Liking, etc. Just make your Lens helpful. "Helpful" varies depending on the keyword you target (or whatever keyword most of your visitors are finding you with). Just think what a person would want if they were typing in [keyword]. It may be validation that a product works, it maybe instructions on how to do something, etc. That makes them feel good and are more apt to check out your affiliate recommendation. My best performing Lens was telling people how I (sort of temporarily) fixed something , then telling them I found a sale on that broken item. It is now converting into sales at about 12% but the commission is only around $2. (Amazon converts well BUT they only give you about 4% of the sale). It took a while to get visitors to the Lens but I did NOT do much, if anything, to promote the Lens. Hope that gives you some idea on how to start. I'm sure PotPieGirl has more advice. Let me know if something does not make sense. At least I think so:) See you around Tim. ditto, ditto, ditto... i couldn't agree more - give me a hamburger and a bottle of beer and a house by the water where i can write to my hearts content - of course i'd need room for my family because life is nothing without them! I've never written on StreetArticles yet, but I read some of the rules. 3. DO NOT have more than 5 words as the anchor text (the words that will be linking to your site). Sorry, but I'll be away from my computer for about 9 hours. I'll check back later. Thought I'd connect with you since we have been in WA about the same time together. I took the 30 day training twice and especially appreciate potpiegirls blogs and magistudio Jays wabinars and instructions. I launched a business at www.comforthealthybikesaddles.com that producing a small income right now. All because of WA. Best of luck to you and MUCH SUCCESS. Congrats on starting your business, "webkab!" Much success to you too! Hey redeemed, thanks for the heads up with my Squidoo Lens! I just fixed it. Charles, you are good at this. Self-Mastery is what I need. I have dreams but not the plan to put them into action because I am not in charge of myself. Thanks for being astute and sharing your insights. There are many techniques to get you to take action. One is imagining the activity done already. What would the positive outcomes for you? I take your point about spending too much time here. The direction I am taking is in article marketing as I have essentially been engaged in writing adcopy of a form for the past 20 years and felt there was a good synergy with that and IM. The difficulty has been getting enough concentrated time to work through the web/blog setup procedure. As a possible way out of this I signed up for the STF Club and that has been some help so far but still find myself getting caught up with the wanting to get the whole knowledge picture sorted out. Now wonder if I;m ever going to get to that stage. Have two sites set up - one is through the STF Club called www.diet-weightdrop.com. The other is www.basicstocktrade.com. I am really interested in investing, the markets and more recently the workings of the financial system that brought the US undone. This latter site is my first foray into it . I have just read what I wrote last night. I sound like a real wanker - sorry about that. let em rephrase. I agree with your sentiments and really appreciate your help so have sent you some gold hopefully. Thanks again for your thoughtfulness (re:gold). Regarding the information overload, I know what you mean. Initially you want to spend time in WA to learn your favorite Internet Marketing method, i.e. Article Marketing, PPC, etc. But later, you will want to come here only when you need help/reference to a certain road block. Otherwise, being in here w/o a purpose will only slow your progress. I know b/c I spend too much time wanting to know everything, and I am working on that downfall. So, if I don't get back to you right away, that means I'm actually DOING some IM work:) Look at it this way, if you can spend less time in here, it means you know what to do and are DOING it. A good sign, yes? Thanks for your help within the forum. Yea I can see your point above. Actually, the other person who told you about Chrome being the cause of your videos not loading is the one to thank. I just gave my input but wasn't the solution:( Good luck w/ IM! I can see the aspirations that I have being very much in line with what you have outlined above. My idea has been to be conservative and tread carefully in commiting myself to any online stuff. There is so much around and a lot of it is just BS in my opinion. The WA has been good but I felt I really needed to commit to setting up a website. going through the process myself rather than getting others to do things for me seemed to be a better way to learn and get experience. With so much info available on WA it has been hard to make headway. With this in mind I joined the WA STF Club and as I said in the forum it has been helpful but having some advice along the way has been very helpful and for that I thank you. I will no doubt have more questions. Thanks Charles, I really apreciate your words, it is better when you talk to someone who has experienced the same feelings. Have a great day ! Hi Charles, I agree with you with the idea to travel around the world and working at the same time, not depending on a job. I just would like to acomplish this goal. Have a great day ! Hi Charles. 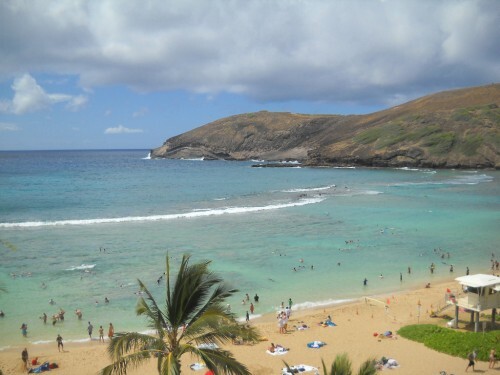 Aloha, and good luck with building your dream. I think a lot of people like you and I are in doubt about working in the broken economic system and want to be in charge of our own life and income. Look forward to sharing ideas. Hi Carolynn! Thanks for the "Buddy request" and will love to add you as a "Buddy." Yes, we are moving out of the industrial age and must not depend on companies taking care of us during our Golden Years. I hope the youth today are not counting on the government and corporate to take care of them later. BTW, Welcome to Wealthy Affiliate (WA)...I just rejoined, too. Looking forward to see you progress in your online business. We'll be your buddy. Check out our website too. Low Profile, yep! Sure! Touch bases with you soon. This is not a low profile kinda business - but you can do whatever you want, whenever you want. So we'll gladly embark on this journey with you. The more the merrier. We believe in win-win. You're Right! Good luck to you too! Actually, as I learned from Jim Cockrum, it's win-win-win for us marketers (merchant-marketer-customer). Better get going with my Lessons. Good luck with your business. Thanks for the welcome. Hope your 8? months here have been profitable.